We are in an era of radical distrust of public education. Increasingly, we turn to standardized tests and standardized curricula-now adopted by all fifty states-as our national surrogates for trust. Legendary school founder and reformer Deborah Meier believes fiercely that schools have to win our faith by showing they can do their job. But she argues just as fiercely that standardized testing is precisely the wrong way to that end. The tests themselves, she argues, cannot give the results they claim. And in the meantime, they undermine the kind of education we actually want. 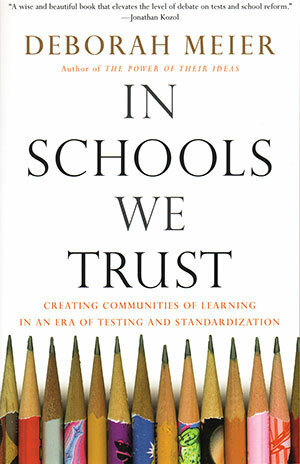 In this multilayered exploration of trust and schools, Meier critiques the ideology of testing and puts forward a different vision, forged in the success stories of small public schools she and her colleagues have created in Boston and New York. These nationally acclaimed schools are built, famously, around trusting teachers-and students and parents-to use their own judgment. Meier traces the enormous educational value of trust; the crucial and complicated trust between parents and teachers; how teachers need to become better judges of each others’ work; how race and class complicate trust at all levels; and how we can begin to ’scale up’ from the kinds of successes she has created.